We can thank the legendary Tatin sisters from turn of the century France for this dish. The sisters are said to have forgotten to put the pastry in the baseof the apple pie they were cooking in their restaurant. So they stuck the pastry on top of the apples and forget ahead. When the pie came out of the oven, they flipped it over and the cooked apples had created a sweet, caramel sauce over a crunchy base. Whatever the origins of this dessert, it remains one of the most delicious, with its combination of crispy, flaky pastry and warm, rich, buttery caramelised fruit. 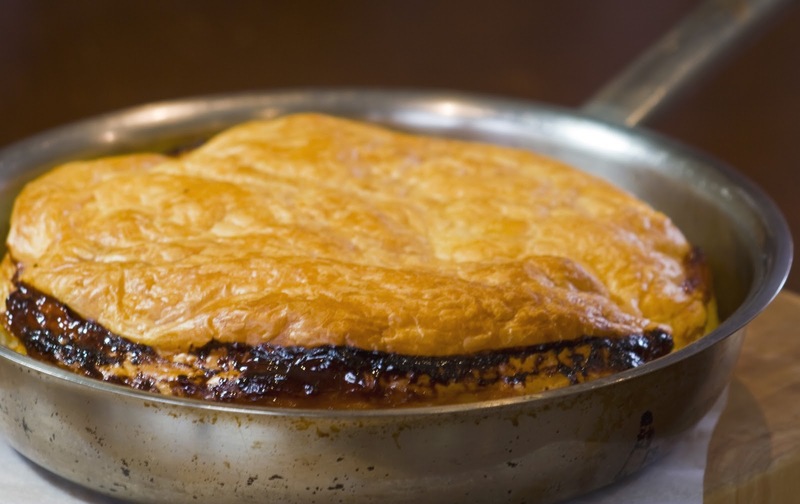 The tarte tatin method can be adapted to include a variety of fruit and is also a great savoury starter or light lunch served with tomato, shallots and goat’s cheese with a flaky pastry base. The options are endless. I use and love the Careme butter puff pastry with this, but if you're keen, make your own. With the warm weather and party season approaching, the freshness of the pineapple and mint works well as a lighter and fresher dessert option, when served with a creamy unsweetened yoghurt. It also provides a great finale to asian foods, which can be difficult to match desserts to. For this, the pineapple tarte tain works perfectly with coconut cream and kaffir lime ice cream. Because pineapples have copious amounts of juice, I cook the caramel pineapples the night before I need to serve the tart, so I can skim off the pineapple juice and make a caramel sauce. If you're using frozen puff pastry, remove the pastry from the freezer at least 24 hours beforehand and thaw in the refrigerator until needed. I cook the tart in a 30cm oven proof frypan with metal handles. If you don’t have one of these you could use a shallow pie dish. Peel, slice and drain the juice from the pineapple into a dish. Heat the butter, sugar, lime juice and vanilla seeds in a 30cm oven proof frypan. Bring the caramel to the boil, cooking for 5 minutes, allowing it to thicken and reduce. Reduce heat to medium and add pineapple and cook for a further 5 minutes. Stirring to ensure it does not burn. Remove from heat and place into a bowl and refrigerate. When set, the liquid juice will separate and settle to the bottom of the bowl. Remove from the refrigerator and drain off the liquid into a bowl and reserve it. Preheat oven to 200C. 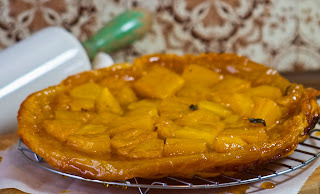 Transfer the drained pineapple and caramel to the oven proof frypan and sprinkle the mint leaves on top. Roll out the thawed puff pastry two centimetres wider than the oven proof frypan. Trim the pastry to make sure it fits neatly contained within the rim of the frypan when tucked in and around the pineapple. Return to the refrigerator to chill for another 20 minutes. While the uncooked tart is chilling, pour the reserved liquid syrup into a small sauce pan and reduce until thickened and golden, this should take about 5 minutes. Remove from the refrigerator and place in the oven, baking for approximately 20 minutes. When the tart is golden and bubbling, remove from the oven. Place a 30centimetre plate over the top of the hot frying pan and carefully invert onto the plate to serve. Top with the unsweetened yoghurt and reduced pineapple syrup and eat while piping hot.